Stress is a very common complaint today, with many of us feeling over-worked, under pressure and without enough hours in the day to get everything done. Besides the problems we often associate with stress, such as tension and anxiety, insomnia and headaches – the digestive system is one that is badly affected by stress. Many people these days eat on the run. They might have a sandwich at their desk at work, or eat a fast food drive through on the way home. If they are suffering from stress from a big day, then the food just won’t digest properly. The body is quite clever in that it recognises that you don’t really need to digest your food while “running away from the tiger” – our natural stress response – so it puts off that activity until later when you are relaxed, and can enter into “rest and digest” mode. But if you’re continually running away from that tiger, when do you relax, eat and digest? Eating under stress, can lead to nutrient deficiencies, as proteins get broken down and our minerals prepared for absorption by hydrochloric acid in the stomach. If stomach acid is reduced by the digestive system becoming underactive due to stress, it can lead to any number of problems from the poor breakdown of the food. Aside from nutritent deficiencies (see blog post: It’s Not What You Eat – It’s What You Absorb), large particles of food moving through the intestine can cause irritation to the gut lining and cause a leaky gut; and food can ferment and become a breeding ground for parasites, fungi and bacteria. You can end up bloated, constipated and always feel heavy and fatigued, just because the body is always too stressed to digest. If you are eating on the run, it is best to choose something easy to digest such as a nutritious juice or smoothies so that the body doesn’t have to work too hard. Stimulating the flow of stomach acid with bitter herbs or apple cider vinegar before meals can help, as can supplemental hydrochloric acid and digestive enzymes, which assist in breaking down the food for you. Ideally though, stress is managed to allow the natural flow of digestive juices to occur at the appropriate times. When it is meal-time, take your time to attune your senses to the food. Look at the food, smell the food, think about eating the food – take several deep breaths and take a moment to quiet the mind. Chew the food very thoroughly, take time to rest after the meal and don’t rush back to work. Meditation is a wonderful skill to practice daily, which helps you enter the “rest and digest” mode more easily. The digestive system is the cornerstone of health, and so often we don’t think of the internal consequences of our stressed out, busy lives. 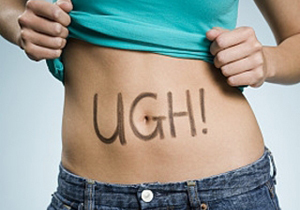 If you think stress may be affecting your digestive system, you can find out more by getting a Digestion Health Report – a stool test, 20 page report analysing your digestion from top to bottom, and a half-hour consultation with our naturopath to review your report and make sure you understand exactly what is going on! Aim to do a little bit of life re-organising so that you can “rest and digest” that little bit more! When I’m stressed at work I’ll try and eat at lunch and I’ll usually feel nauseous after and I burp a lot. It’s not good if I’m in meetings! Can I take something quick and easy to stop these symptoms? Or to stop them happening? I just don’t have time to relax over my lunch. There are several things that you can try. One key is to increase your stomach acid levels by having a teaspoon or two of some apple cider vinegar in water about fifteen minutes before you eat. That will help you to digest your food better. Having something that is really easy to digest is also helpful, so instead of having a big heavy meal at lunch, have a smoothie or something very gentle and easy on the digestion. You can also take digestive supplements that help you digest your food better, if you do need to eat “on the run”. The nausea and burping following the meal just means that it is sitting in your belly for too long and not digesting and moving on. Please contact us at http://embracinghealth.com.au/health-products/healthmentoring/ and we can sort out a personalised program for you. Previous post: Healthy, Hot & Energized! Next post: Are You In Oestrogen Overload?